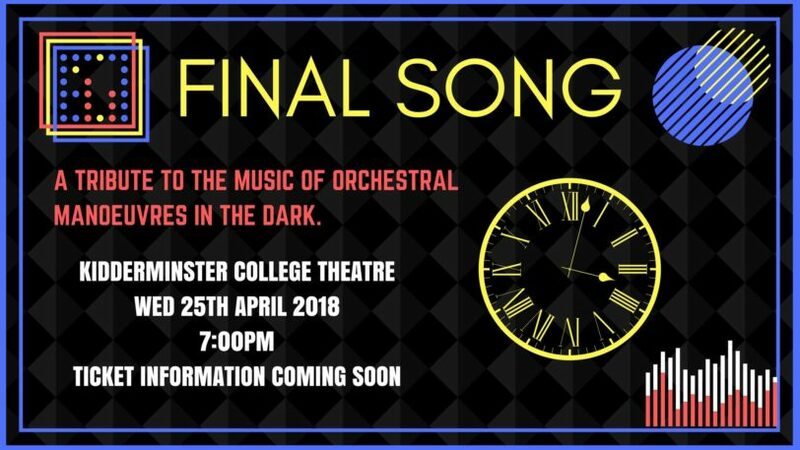 Organised by Stanlow Incorporated, Kidderminster College Year 1 Music Performance presents ‘Final Song: A Tribute To The Music Of Orchestral Manoeuvres In The Dark’. This is an exclusive, one night only performance that will take place in the college theatre, therefore tickets for the event will be very limited. These will be available to buy via telephone from Kidderminster College reception at a price of £15.00 each (no concessions) and can be paid for over the phone, or at the door on the night when the tickets will be available to collect. Due to this being an exclusive ‘one night only’ performance in the college theatre, audience numbers will be strictly limited, and tickets will be distributed on a first-come first-serve basis.